1. 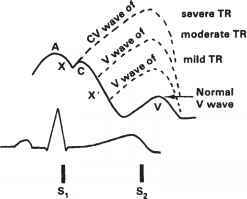 How can you recognize a higher than normal V wave at a glance? ANS: By recognizing a Y descent of greater amplitude than normal. 2. What are the common causes of a higher than normal jugular V wave? ANS: a. Excessive right atrial filling either from (1) above the tricuspid valve, as in ASD or anomalous pulmonary venous connection, or (2) below the tricuspid valve as in TR. b. Loss of compliance of the right atrium from either (1) outside the heart, i.e., constrictive pericarditis, or (2) inside the heart, i.e., atrial tumors or high diastolic pressures in the atrioventricle due to the RV hypertrophy of pulmonary outflow obstruction or heart failure. 3. How does the high V wave of excess right atrial filling from above the tricuspid valve (e.g., ASD) differ from the V wave of TR? ANS: In ASD there is a large X', as well as a large Y descent giving a prominent double descent. The large X' is due to the large volume ejected by the RV pulling vigorously down on the floor of the atrium. In TR the regurgitant wave tends to obliterate the X' descent. 4. Why is it easy to distinguish the prominent double descent of uncomplicated ASD from that due to constrictive pericarditis? ANS: In constrictive pericarditis the venous pressure will be elevated above normal and usually a Y descent is dominant. 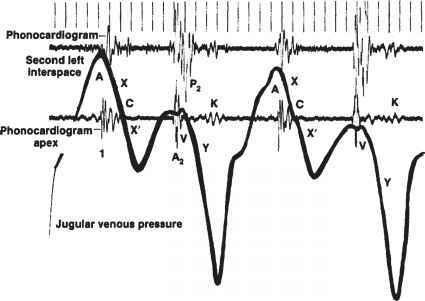 Constrictive pericarditis produces an early diastolic dip and plateau, i.e., an exaggerated Y ending with an abrupt jerky rise (Friedreich's sign). In uncomplicated ASD the venous pressure is normal and the X' is usually dominant. Note: In restrictive cardiomyopathy the jugular pressure and waves are similar to that of constrictive pericarditis, i.e., the jugular pressure is elevated and may have an X' with a dominant Y descent. 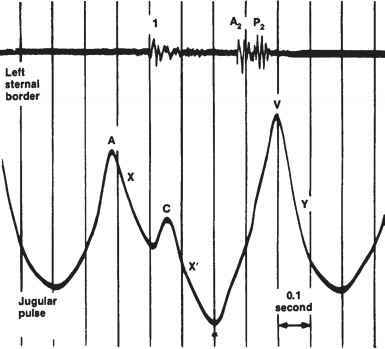 Shown is a jugular pulse tracing from patient with an atrial septa defect since the eye cannot see the C wave, it appears to be only a large double descent with the systolic descent (X plus X') appearing larger than the Y descent. As the degree of TR increases, the X' descent is increasingly encroached upon. With severe TR, no X' descent is seen, and the jugular pulse is said to be "ventricularized." Severe constrictive pericarditis. Shown is a jugular pulse tracing from a patient with severe constrictive pericarditis. Note the double descent with a dominant Y descent and relatively small X' descent. K indicates a pericardial knock sound. (From E. Craige, Heart Sounds. In E. Braunwald [ed. 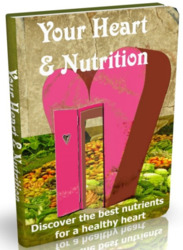 ], Heart Disease [2nd ed.]. Philadelphia: Saunders, 1984). 5. Why does cardiac surgery usually result in an increase in Y descent at the expense of the X' ? ANS: a. Sutures in the right atrium to close the opening made for tube insertion can cause loss of compliance of the right atrium. b. The right atrial pericardium may not be suspended firmly to the surrounding structures after surgery so that when the floor of the atrium is pulled down by RV contraction the entire atrium tends to move down more than normally, i.e., the atrial resistance to a downward pull is attenuated. 6. 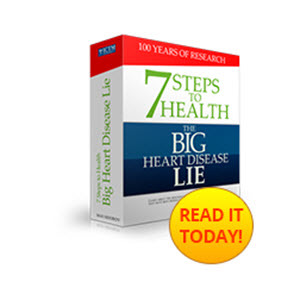 Why will a high mid-diastolic pressure of pulmonary hypertension or stenosis have a high V wave? 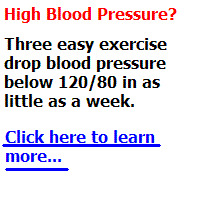 ANS: Pulmonary hypertension or stenosis thickens the RV, thus raising the diastolic pressures. If there is a high pressure in this common atrioventricular (AV) chamber throughout diastole, then when the tricuspid valve is closed during systole the atrial V wave rises from a baseline that is higher than normal.